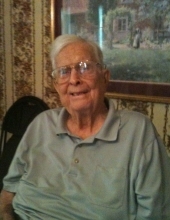 Joseph Benjamin Newsome, 96, of Fayetteville, GA., passed away on March 21, 2019. He was born in Cordele, GA. on June 26, 1922 to the late Ben Newsome and Mary Moreland Newsome. Joe served in World War II in the 263rd Army Air Force base unit as a fighter pilot; he was in the 8th, and then later on, the 9th Army Air Force. Joe was to go overseas with his unit as a fighter pilot, but was pulled out at the last minute because of his record and sent to the 72nd fighter wing. As a sergeant, he ended up training pilots, including British pilots, in new fighter tactics, including link celestial training, for the remainder of the war. He primarily trained pilots for P47 Thunderbolt fighters. After the war, he served in the Reserves for 5 years. During the war, Joe attended Iowa State University and Macalester College, in St. Paul, MN. in engineering on the G.I. bill. He worked as an electrical substation engineer for most of his career, first for Southern States in Hampton, GA., then MEMCO Engineering in Comack, Long Island, N.Y. He also worked for Dristan Corporation out of Louisiana, as head of the Atlanta Office. At the age of 60, Joe started his own company, National Electrical Substation Products, in Fayetteville, GA. He ran this business for 16 years until he retired at age 76. Joe was preceded in death by his wife of 55 years, Jane Colleen Clarke Newsome, his parents, Ben and Mary, his sisters, Harriet and Carolyn, and brother, Jelks. He is survived by his brother, Alec Newsome; daughter Pam Koenig (David); son, Mike Newsome (Joyce); and grandchildren, Matthew Koenig, Cameron Koenig, Timothy Newsome, and Zachary Newsome; step-grandchildren, Heather Farrow and Michael Scuderi. A funeral service will be held at 2:00 P.M. on Sunday, March 24, 2019 at the Chapel of Mowell Funeral Home, Fayetteville, GA., with Dr. Glenn Stringham officiating. The family will receive friends from 1:00-2:00 PM prior to the service at the funeral home. Burial will take place at Brooks Memorial Gardens in Brooks, GA., with military honors. To send flowers or a remembrance gift to the family of Joseph Benjamin Newsome, please visit our Tribute Store. "Email Address" would like to share the life celebration of Joseph Benjamin Newsome. Click on the "link" to go to share a favorite memory or leave a condolence message for the family.